If you're from the Seattle area, you might know where the inspiration from this monster came from. If not, the Gumwall in Seattle is a very interesting, disgusting thing.When they announced it was to be cleaned, I could only imagine it roaring to life in protest to become one of my favorite monster types: an ooze! Slimy Doom (Ex) Bite — injury; Save Fort DC 19, Onset 1 day, Frequency 1/day, Effect 1d4 Con damage, target must make second save or the damage is drain instead; Cure 2 consecutive saves. Any opponent within 5 feet of the gumwall ooze who successfully hits it with a melee attack automatically receives a ropey tendril of chewed gum affixed to him. 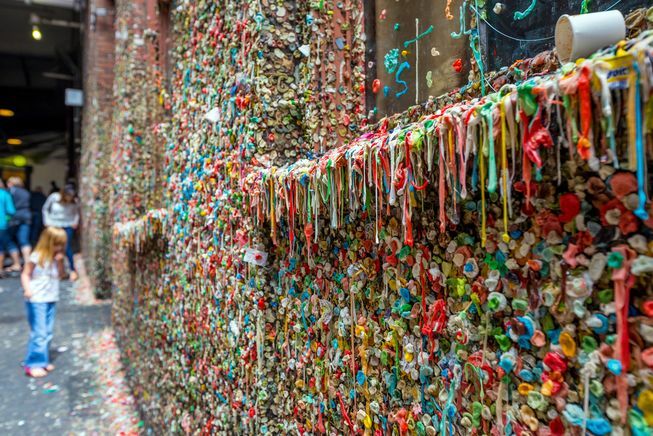 Those affected by the gum tendrils cannot move more than 5 feet away from the gumwall ooze and take a –2 penalty to AC as long as they are stuck. The gumwall ooze tendril can be removed by making an opposed Strength check as a standard action or by dealing 8 points of slashing damage to the tendril (AC 13, damage does not deplete the gumwall ooze’s actual hit points, nor incur a new tendril). The gumwall ooze cannot move more than 5 feet away from the target, but can release its tendril as a free action. There is no limit to the number of tendrils that a gumwall ooze can produce, but only one tendril can affect each individual target at a time. A gumwall ooze has a +4 bonus to attacks on opponents that have its tendrils affixed to them. Something I'm really interested in are Pathfinder's Mythic rules. These appeared a few years ago as a few standalone books, as well as the campaign Wrath of the Righteous. It's a very dramatic subsystem within Pathfinder to add incredibly powerful abilities to a PCs, and accordingly, monsters. If you have not seen them, I suggest checking them out. This also plays into my own changes to the Mythic rules you can find here. Inspired by things such as Highlander and the general trope of "There can only be one" kind of thing, I've been working on some homebrew rules as a way to change the flow of Mythic power around. The idea is for the more amoral of PCs to pick this up as a quick path to power, or for villain NPCs to use to harass the PCs. You gain all the regular benefits of a Mythic tier, except as follows: Instead of gaining two mythic power you gain one corrupted mythic power. Corrupted mythic power can be used just like regular mythic power, but if used to surge, you may only add 1d6, regardless of your actual tier. Each corrupted tier only counts for 1/2 of a tier for the purposes of determining the potency of your mythic abilities (minimum 1). When you use the Consume Legend power, do not count corrupted tiers as a penalty to your contested mythic check. As a full round action, a creature can make an attack against another mythic creature. If it hits, and deals damage, both creatures must make a contested mythic check. The attacking creature takes a -2 penalty per tier on this check. Creatures can spend any amount of Mythic points to surge this roll. If the attacking creature succeeds, they steal 1d4 trials. If the defending creature succeeds, no trials are lost. If the defending creature succeeds by 10 or more, they steal 1d4 trials from the attacker. These trials can result in the loss and gain of mythic tiers, but cannot reduce their trials below 1. If you have thoughts on how these mechanics can be better, tell me on Twitter @raathcatarn. If you're a Pathfinder GM, come hang out in the Order of Gamemasters and discuss with myself and others there! In the middle of Tarn trying to suss out what this caravan was doing leaving Kenebres, a tarp on the back got yanked off, revealing a group of menacing tieflings. I watched as Tarn was pierced with daggers before he could even stumble back. Ka'ar hastily cast a spell, conjuring stones that pelted everyone and covered the ground in sharp rocks. I heard Heilig shout as she pulled her fauchard and faced off against the four mongrel men around her. Before I even knew what was happening, more daggers pierced Tarn and he began to look pale and sickly. I trudged through the stones, desperate to get to his attacker. I climbed onto the caravan, letting my rage take over. As I clamored onto the caravan, I watched Tarn get overwhelmed by mongrels and crumple to the ground. I felt my rage nearly break as I watched him fall, until another mongrel crushed his skull. Then a dagger was thrust at me, only to clang off my armor. This was Tarn's attacker, and in his face I saw my fury. I felt my chains grow hot and heavy as I lashed out, the glowing links wrapping around and digging into his neck. "You have made a mistake today," and with one swift motion, ripped the chains from his body. After that, I remember little. My rage only ended when the last tiefling surrendered. He was bound and I went to Tarn. Seeing his lifeless form was almost too much as I carried him to the caravan. The way back to our camp in Kenebres was dim and bittersweet. I took Tarn and found my way to clerics of Iomedae. They assured me he would be brought back, that it was the will of The Inheritor. So I watched as they preformed the resurrection. I wept. I don't know why. First of my friends and I failed him already? I promised him I'd never allow it again. This day was not done yet, though. After all the drama with Tarn, we searched this caravan. In it, I found a most beautiful sword. I picked it up in awe and was immediately struck with visions of the Hidden Light. I saw through her eyes as a warhammer struck down a skeletal figure. Horrific monsters, one after the other, each falling to this hammer. When it was over, the weapon in my hand felt warm. I held it up only to find it shaped identical to the hammer in these visions. I looked up to see the others staring at me. "It's called Radiance," as much shocked by my words as they were, "and it belongs to me." How I knew what it was called, or knew that it was now bonded to me, I don't know. But it was another clue about who the Hidden Light is and where she came from. The end came for Golarion. The Anchors obeyed the Gatherer without question. The gods reacted swiftly in an attempt to quash the powers loosed by such artifacts. Instead they were shredded, their forms were reduced to chaotic streams of raw magic, ripping through the Outer Sphere. Every deity's domain was affected, being dissolved into raw planar material, carrying out the will of the Gatherer. Most lesser deities had no time to escape, subsumed into the churning chaos of the outer planes. The Inner Planes began to slowly fade. The Elemental Planes came first, all of their structure melting away into ash and fog. The Material Plane came next, much to the horror its inhabitants. Massive fonts of energy rushed from every direction, every angle. Every creature was consumed by the energies of their plane of origin until nothing but barren rock remained. Then, even that began to crack and crumble into a grey formless mist. For a time, the Gatherer stood in nothing. Panicked and confused, they wandered these mists for a time, trying to find something of substance. “The world that was, untouched by the struggle between good and evil, between law and chaos. To be judged by what we do, not who we are.” The mists faded. The nothing went black. The Gatherer closed their eyes, pleaded and became the Dreamer. Just this last week, I've finally begun playing my Half-Orc Paladin, Sycillya. I finally managed to hash out her backstory to a place I like, and after all the crunchy bits in the last post, I figured I'd share it with you. Here is the story of how Sycillya found her Hidden Light. They found her in the woods, huddle down in a ragged blanket among the roots of a tree. There was no resistance when they scooped her up, taking note of her grayish skin and pronounced canines. Small as she was - just a child - they noticed muscle rippling under her skin. The three men carried her back to their horses and rode swiftly back to camp. Half a mile away, a small band of adventurers lay among the trees, eyes closed, their wounds still bleeding as the sun set. They named her Sycillya. They asked of her name when they found her, but she didn't have it to give. One of the men who found her chose it. Such a soft name, a human name. A few of the older kids took to calling her Sissy for a while - until she broke a boy’s nose and tore a chunk from another’s arm with her teeth. After that, they called her Monster… behind her back. That didn't matter. She grew stronger for it. Every day she woke at dawn to some menial task such as cleaning the kitchens after a feast or mucking the stables. There was always something to do, and she was often chosen first to do it. Even this young, she was bigger than most of the other kids, and that gave her the unfortunate distinction of being useful. At the age of twelve, it was decided she was strong enough to be put to real work. As strong as most of the other adults around her, her patrons were eager to see what she was capable of. It was grueling. From sunup to sundown, she was worked. They told her it was to make her more valuable. That's when she began to realize how bad off she was. The dilapidated building she stayed in with a dozen other kids. The minimal food and water. The beatings. She didn’t want to end up like the failures. By her teens, her masters learned how to use their tool. They raised her to hunt. Not animals, but escapees. They trained her to hunt them down and either coerce them into coming back or bringing back the body. She reveled in it, finding the wretches huddled in the woods surrounding their camp. Even though they kept her chained, she never failed to bring someone back. Another dream. Two figures stood in a dense wood: a Human woman seemingly pleading with a Dwarven man. Both in blacks and reds and both speaking in low, sad voices. She placed a hand on his shoulder and asked him a question. After a long pause, a white light shot from the sky, enveloping them both, blinding Sycillya. By adulthood, they had molded her into a machine. Enforcer in the camp, hunter of escapees. No one escaped. She was perfectly loyal to her masters, seeing first-hand the price of weakness. Every pitiful slave in the camp feared her glare, and feared the chains she now wore with pride. They were her weapons, her power. A feminine figure stood silhouetted before a burst of bright colors. All she could make out of the woman was a sword bathed in a silvery light and a perfect, white circle emblazoned on her massive, scaled tower shield. She bolted up, and scrambled to the sound of the voice. Her chains rattled around her as she strode from her place in the camp to a well-lit, large tent. Sycillya nodded and headed to grab her few things. The man called out, “Make an example of one, would you?” Another nod. She went back to her tent, took a swig of ice-cold coffee from a cup on the floor and left. Finding the tracks were easy enough. She went over the tracks in her head. Four children, aged 8-12. Walked in a tight group. Moved swiftly, but quietly. Light steps. She followed them out into the woods. Even then, the trail wasn’t obscured. Broken branches, footprints in mud. A branch cracked and she snapped her head around to look, only to be blinded by another vision. A woman lay crumpled on the ground, black hair obscuring her face, clutching her stomach. Then, in a city Sycillya had never seen, what looked to be the same woman stood in front of her. A child was walking away, the woman watching intently. A large rune glowed on the back of the child’s head, then there was an explosion. Screams. The same woman, bent over the bed of a child. The same black hair fell over her face, and a deep red glow filled the room. From the child’s lips flowed a thick white smoke, into a clear gemstone. Sycillya gripped the tree next to her as the light faded. She felt her eyes fill with tears, but shook them out with a low growl. “Sycillya?” Called a meek voice. She whipped her chain around and snapped it at the voice. There was a cry of pain and then the child began to cry. “You knew better than to try to escape. You knew I would come!” The other three half-orc children huddled around the wounded one. She began to advance on him, hardening her heart for the task. Visions of the woman lying crumpled on the ground, tears stained on her unconscious face. Sycillya raised the chain as she again saw the child lost to the force of explosive magic. The children hesitated for a moment, then turn and fled. Sycillya leaned against the trunk of a tree and began desperately thinking of how to explain this to her master. She hung her head as her master advanced on her. Shame and rage paralyzed her. She stared at her manacles, and was reminded of her place. Be free of the darkness, let your hidden light shine. Sycillya closed her eyes. She felt her body lighten, as her manacles grew heavy and hot. All her fear and anger flowed into the chains. The footsteps stopped. When she opened her eyes, the chains that held her manacles glowed with a fierce white light. Steam rose from around her body, the heat of the light burning away her fear. Life must flourish, and you must see that it does so unbound. Her master hesitated for a moment, and that was all Sycillya needed. The chain hissed through the night and struck her master across the face. He screamed in agony as the light clung to him, searing his flesh. Again and again she swung until he lay bloodied and burned on the forest floor. She stood for a moment, breathing heavily and her light fading away. Then her instincts kicked in. More would come soon. She stripped her master of anything valuable - armor, a bow and arrows, rope and a coin purse - and fled West to Eor, to seek the Hidden Light. That's the story of Sycillya, Paladin of the Hidden Light. Sorry for any spelling or grammatical errors! They'll get fixed. If you want to follow along with her progress and story, you can see my live notes in this Google Doc or you can watch her live sheet in this Google Sheet. Curious about the Hidden Light? Watch this blog for a post about the PC that had become the Hidden Light and is now inspiring new champions. As always, leave comments or bug me on Twitter!